The Eastern Economic Corridor is one of the flagship development projects of the Thai government. It will include new industrial areas, the expansion of ports and airports, and new railway connections. 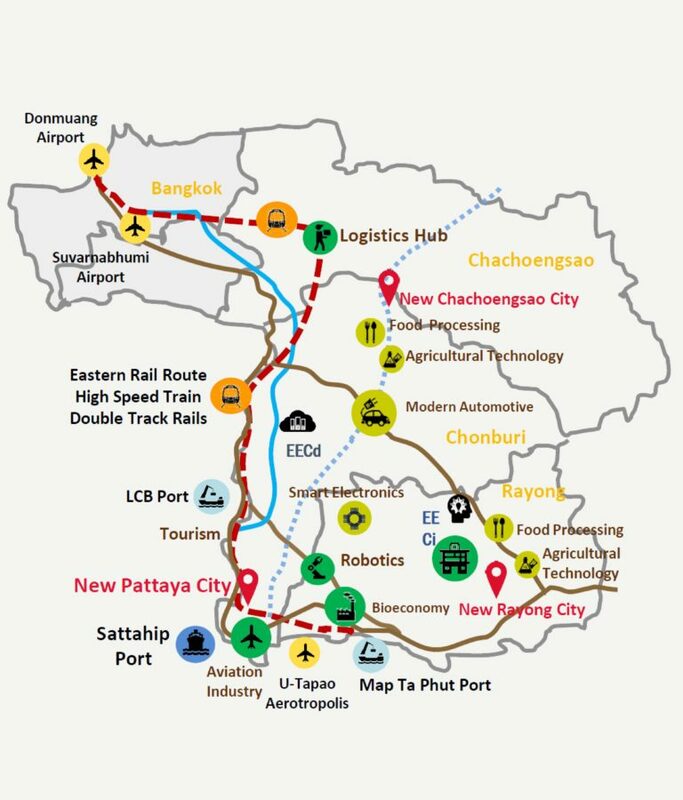 Some large infrastructure projects in the Eastern Economic Corridor are opposed by local communities, while a number have high costs and may not be able to proceed at the desired pace, researchers at the Thailand Development Research Institute (TDRI) warned in October 2017. (6). In June 2016, the Thai government, then led by a military junta that had come to power after a coup d'état in May 2014, approved the Eastern Economic Corridor Development project (EEC), aimed at further developing the provinces of Chon Buri, Rayong, and Chachoengsao, in the eastern part of the country. Industrial development in the region started three decades ago with the Eastern Seaboard Development Programme and some of the most important industrial areas in the country, mainly focused on the petrochemical sector and the automotive and electronics industries, are located in these 3 provinces. The new project aims at modernizing these industries and also at expanding the industrial areas in that region in order to foster the development of new sectors. Thus, according to the government's plan, the Eastern Economic Corridor Development project will promote 10 target industries ranging from robotics and aviation, to wellness tourism or biotechnology. The project is part of the Thailand 4.0 strategy that seeks to modernize the country in order to help it become a developed country. 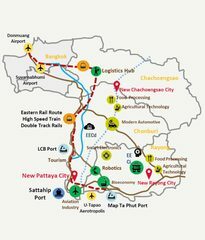 To help develop these industries, the government has also planned several big infrastructure projects, mainly the expansion of the Laem Chabang port, the expansion of U-Tapao airport, a high-speed connection between Bangkok and Rayong, double track railways to connect cities with ports and the development of the deep-sea port at Map Ta Phut. The plan also includes some urban development to build so-called smart cities, where digital technology would be integrated with the life of citizens. Nevertheless, activists say that the government is proceeding with the project without proper public consultations and that the Environmental and Health Impact Assessments are not comprehensive enough  because the government has approved specific laws to ease the processes. In May 2017, Prime Minister, Prayuth Chan-ocha, invoked the controversial Article 44 to speed up the approval of the EEC. The Thai Government has also linked the project to China's One Belt One Road initiative . Some academics have also raised concerns about the privileges that will be given to companies and that might lead to land grabbing in the area . There have already been problems in the region related to health issues due to the hazardous substances released by the petrochemical factories in the Map Ta Phut industrial state, double track railways to connect the cities with the ports as well as the development of the deep-sea ports at Map Ta Phut and Laem Chabang. The plan also includes some urban development to build the so-called smart cities, supposedly one in each province. Activists say that the government is proceeding with the project without proper public consultations or Environmental and Health Impact Assessments . In May 2017, the Prime Minister, Prayuth Chan-ocha, invoked the controversial Article 44 to speed up the approval of the EEC. The article 44 is a constitutional provision that allows the military to pass any measure “for the sake of the reforms in any field” overriding the normal legislative process. In 2016, the government also approved several orders that allow the government to assigned projects to companies before the EIA process is completed. Some academics have also raised concerns about the privileges that will be given to companies and that might lead to land grabbing in the area. Some others also think that the new industries can aggravate the health issues already suffered in the area due to the hazardous substances released by the petrochemical factories, mainly in the Map Ta Phut industrial estate. Some of the groups opposing the project are the Eastern People's Network and the Special Economic Zone Watch Network, among others. 2) the New S-Curve or new sectors that the government wants to target: robotics, aviation and logistics, biofuels and biochemicals, digital, and medical hub. From the private sector, the country’s largest petrochemical company, PTT Global Chemical (PTTGC.BK) announced a $985 million olefins plant in the EEC in January 2018. Top industrial estate developer, Amata Corporation Pcl (AMATA.BK) increased its sales target last year in the EEC, anticipating more investors. Amata also partnered with Swedish Saab AB (SAABb.ST) to study the development of an aerospace city. The industrial east is already home to foreign auto manufacturers such as Toyota (7203.T), Honda (7267.T) and Ford (F.N), that gave Thailand the moniker, “Detroit of the East”, and also houses petrochemical and electronic companies. (5). Why? Explain briefly. The project is going ahead and proceeding quickly. The government has opened bidding processes for several of the infrastructure projects and is looking for investors.